Last week on the market, I got some green asparagus and prepared it in the Spanish way as grilled asparagus “a la plancha”. I discovered this tasty stuff in Spain and it was a love at first bite as it is actually one of the few vegetarian tapas in Spain. 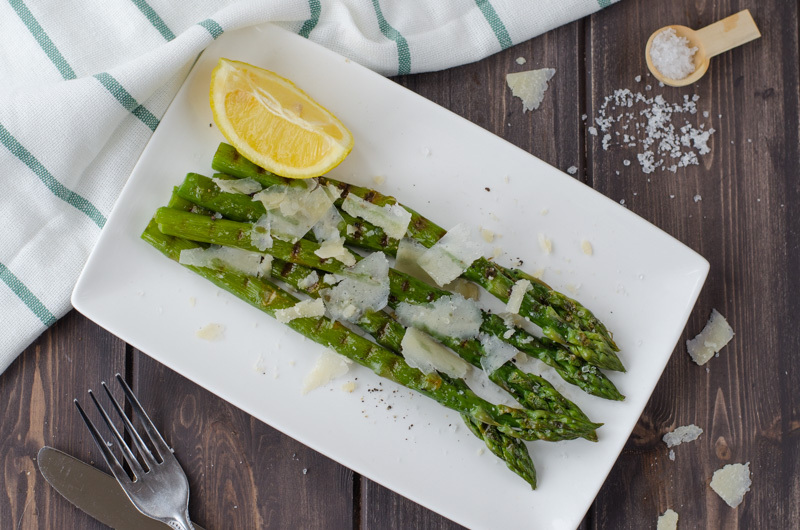 Grilled asparagus is green asparagus shortly boiled and then grilled with olive oil, served with salty crystals “fleur de sel” and parmesan. It is great as a starter or side dish. Even if you don´t have the plancha grill, you can prepare the grilled asparagus at home. Either you grill the asparagus in the contact electric grill (to grill it both sides at once), either you use the grill in the oven (then you will need to turn the asparagus so that it grills from both sides). 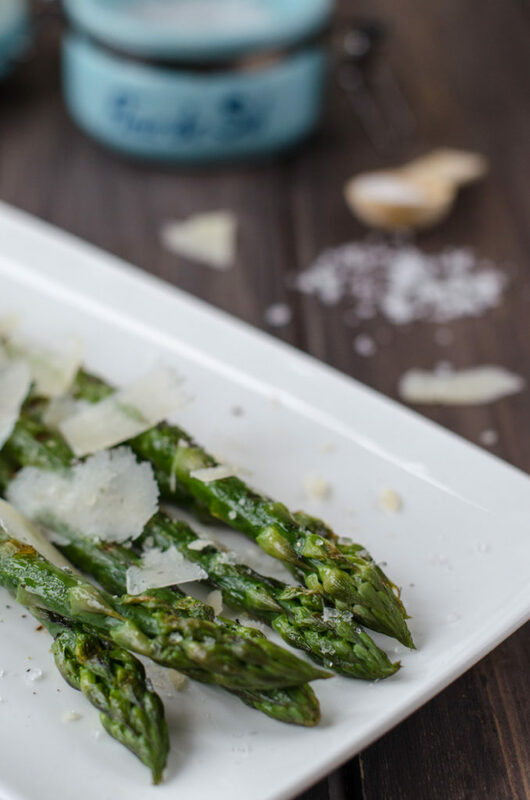 Grilled asparagus is ready in nearly 20 minutes so if you need to prepare a dinner for more people and you are limited by the time, this a thing to do as a starter! You just wash the asparagus, cut off the ends and boil it for 2 minutes. Then you let them drain and cover with olive oil, place them on the grill and grill for about 2 minutes from both sides, and you serve it with fleur de sel, black pepper and parmesan. I also add lemon if somebody wants to add some fresh lemon juice. I love fleur de sel in salads and on veggies in general. Those little salt crystals are gourmet alternative to table salt, obtained from the top layer of the salt bed. 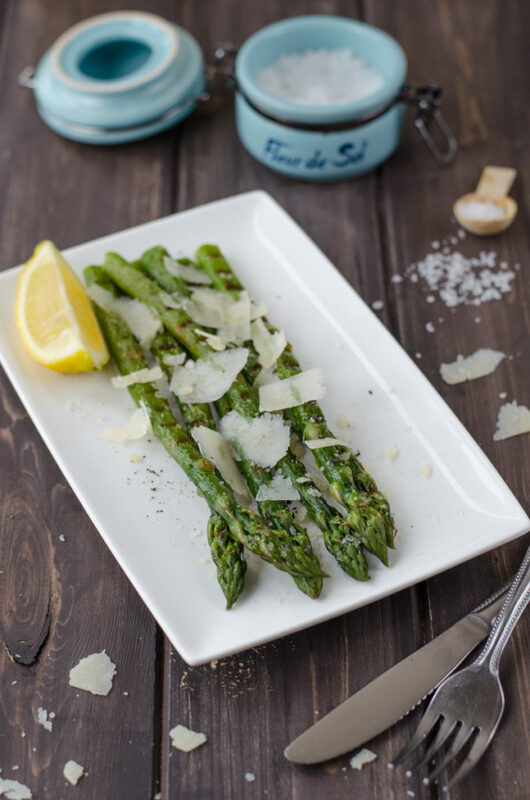 Green asparagus shortly boiled and then grilled with olive oil, served with salty crystals "fleur de sel" and parmesan. It is a delicious starter or side dish. Wash the asparagus and cut off the woody parts of each. Cook all the asparagus in boiling water or steam for 2 minutes, leave drain. 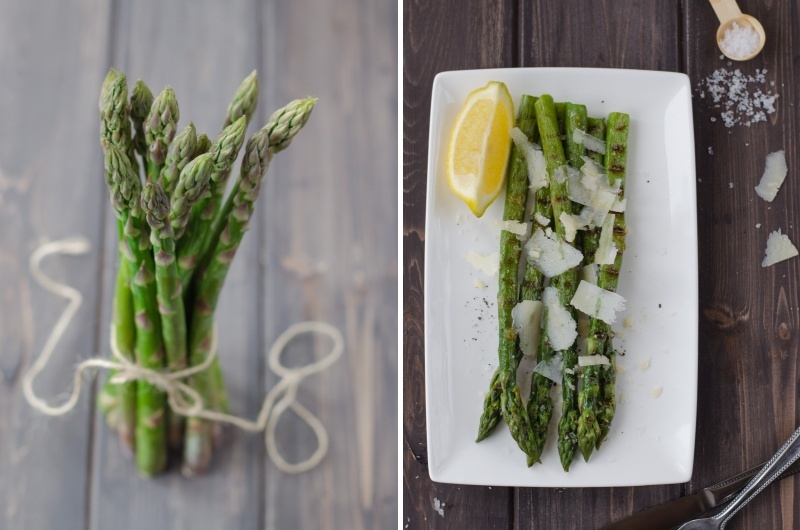 In a long tray, coat the drained asparagus with olive oil. 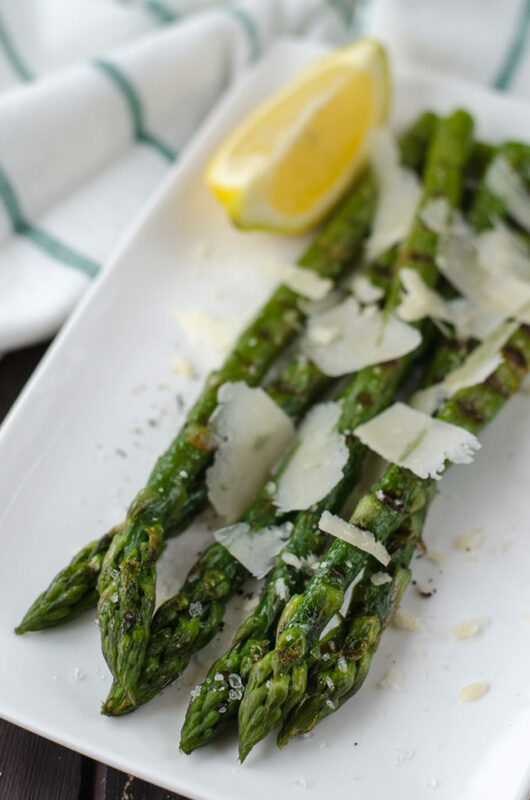 Place all asparagus on the grill for 2 minutes (you may be doing this in two batches, depending on the size of your grill). If you grill it in the oven, then you will need to turn them after 2 minutes so they grill from both sides. 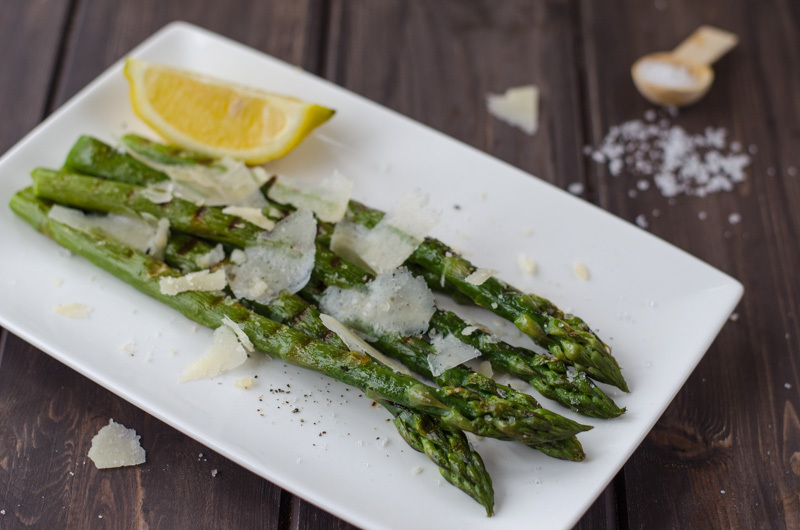 Serve the grilled asparagus sprinkled with fleur de sel, pepper and parmesan. You can add some lemon juice too. Please do let me know how it turned out – you can do that either via leaving a comment below or sharing your picture on Instagram using the hashtag #1001voyagesgourmands !